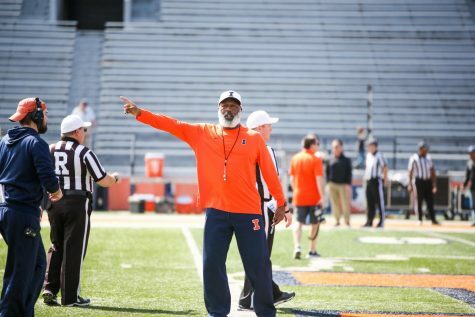 Illinois head coach Lovie Smith calls the defensive plays during the game against Minnesota at Memorial Stadium on Saturday, Nov. 3, 2018. 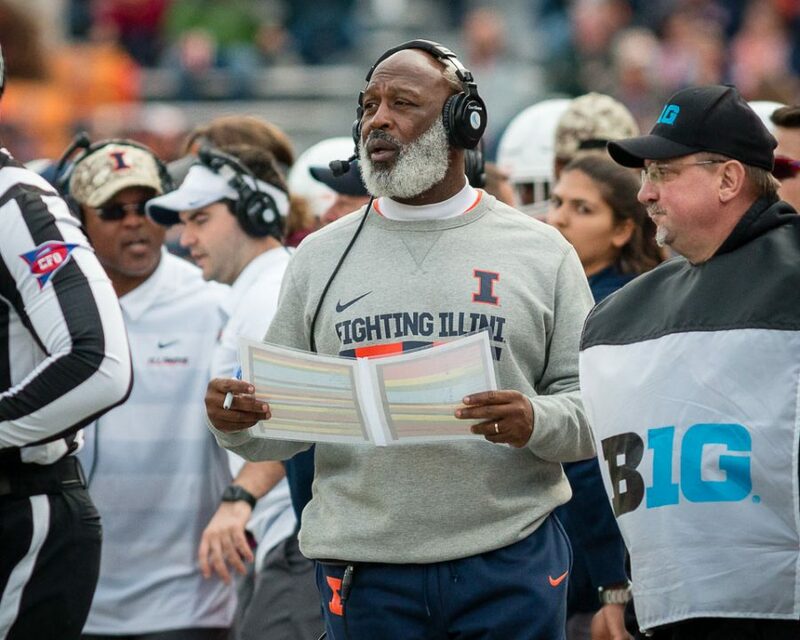 The finale of Lovie Smith’s third year at Illinois repeated familiar themes. Illinois failed to convert on multiple opportunities to score, allowed another team to dominate them with the run game and dropped an abundance of passes. 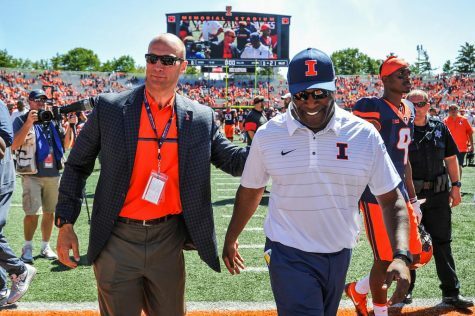 Lovie Smith has won four Big Ten games along the way to a 9-27 overall record (4-23 Big Ten) in Champaign, and Illinois was blown out in the majority of its seven Big Ten losses this season, losing by more than 20 points on average (20.2). 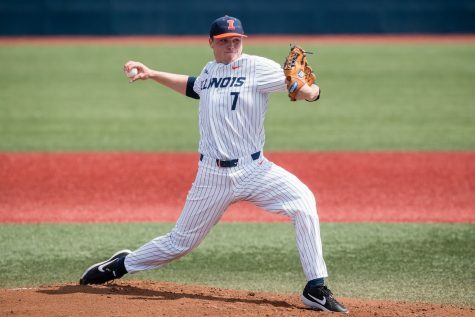 AJ Bush put Illinois in positions to succeed on Saturday afternoon. The graduate transfer completed 23 of 39 pass attempts for 281 yards, a touchdown and an interception. But he would have had over 30 completions had the Illinois receivers not let a number of passes slip through their hands — or careen off their visor. Sam Mays had two season-defining drops during the game. The first came on a critical third down in the second quarter. Mays was open in the middle of the field and Bush hit him right on the hands with a crisp pass, but the senior couldn’t haul it in for the first down. Later, after Illinois held Northwestern to a field goal to open the second half, Mays dropped a deep bomb from Bush — which looked like a touchdown — on a crucial third and eight. He did, however, catch four passes for 69 yards (and so did sophomore Dominic Stampley), including a 28-yard reception. Sophomore Ricky Smalling wasn’t immune to the drops either, but he put up a season-high 72 receiving yards on seven catches and had a superb 10-yard grab for a touchdown that pulled Illinois within a possession late in the game. The receiving corps was ripped apart early by the loss of senior Mike Dudek in the opener, as well as the early loss of promising freshman Edwin Carter, Jr. 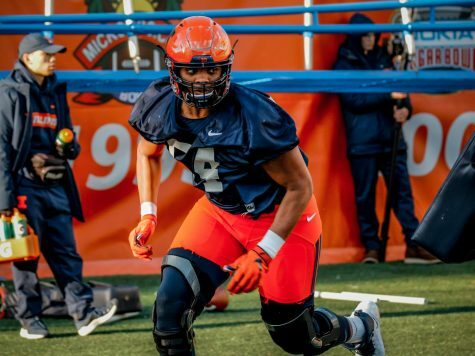 Talented tight end Louis Dorsey’s midseason departure probably didn’t make matters better, but this is a group that held back a much-improved Illinois offense this season. Northwestern had the worst rushing offense in the Big Ten coming into the game (101.5 yards per game) but broke out for a season-high 261 yards. Freshman Isaiah Bowser had a career-high 166 rushing yards on 18 carries, for an average of 9.2 yards per carry. He got free for a 55-yard run in the first quarter and he’d racked up over 100 yards with five minutes still to play in the second. Chad Hanaoka and John Moten added 48 and 47 yards, respectively, on eight carries each. 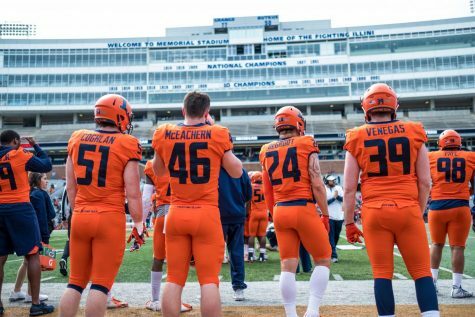 The Illinois defense gave up an average of 275.4 rushing yards during the Big Ten campaign, by far the worst in the conference, and the unit didn’t show much improvement after Smith took over in the wake of Hardy Nickerson’s resignation. 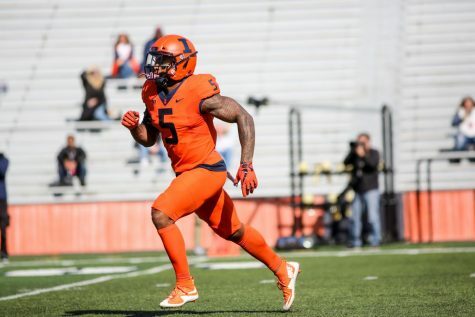 The unit is young — linebacker Del’Shawn Phillips is the lone senior — but the defense was routinely run over by Big Ten foes, contributing to Illinois generally falling off late in games. Saturday was no different, as Northwestern averaged 5.7 yards on the ground and quarterback Clayton Thorson only attempted 18 passes. 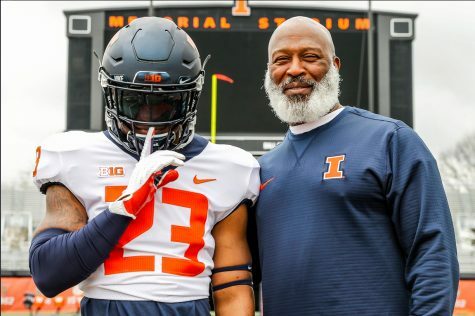 Lovie Smith will be returning for a fourth year at Illinois in 2019 (and receiving a $1 million bonus per his contract). 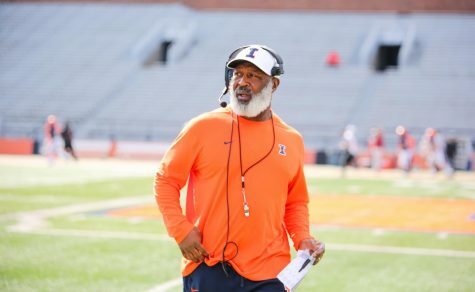 His .333 winning percentage with the Illini is not what was promised with his hire, and the fan base is seemingly losing patience with the NFL veteran; 2019 needs to be better. 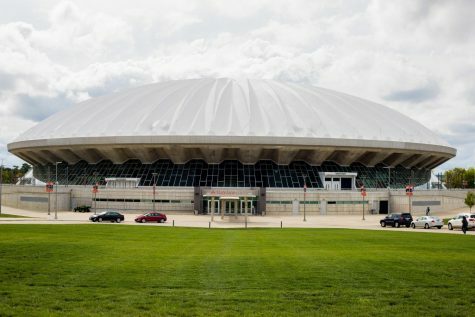 Illinois is only losing nine seniors, but the staff may have its hands full trying to avoid a mass of transfers, a problem it encountered last season. Two players thought to be major contributors, Bennett Williams and Louis Dorsey, left the program during the season for different reasons amid several other departures and a large number of suspensions to start the year. Additionally, Smith is down two defensive coaches and faces a major challenge in identifying the right defensive coordinator to revamp the unit. As of right now, the Illini have the No. 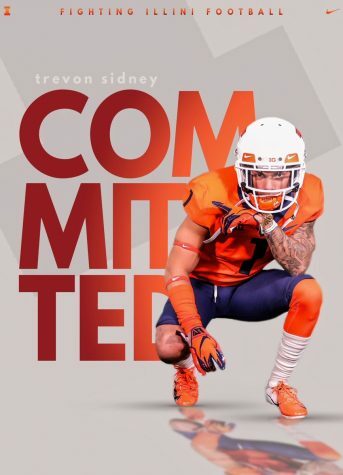 12 recruiting class in the Big Ten, though it is anchored by talented commits Marquez Beason — who could immediately contribute at wide receiver — and quarterback Isaiah Williams. 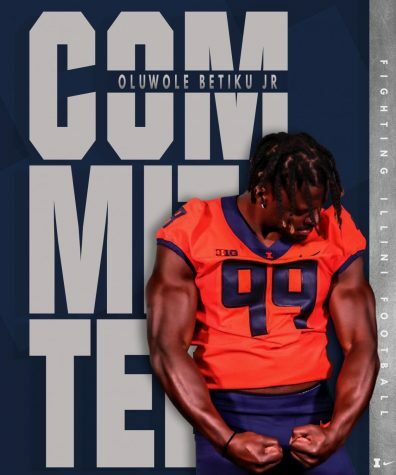 Illinois needs to retain its current personnel and recruits while adding multiple key staff members. It’s going to be an eventful offseason. Unlike its defensive counterpart, the Illinois offense was relatively successful this year, including against Northwestern, at times. The Illini out-gained the Wildcats 435-371 as Bush threw the ball more accurately than at any other point during the season. Junior running back Reggie Corbin ran for 78 yards on 13 carries, averaging 6 yards per carry and breaking out for a long of 24. Bush fared respectably, adding 56 yards on 16 carries. The unit was plagued by drops, as its receivers routinely got open but failed to connect on receptions, and Rod Smith’s conservative play calls took some opportunities away. There was need for better execution, especially from the receivers, but Illinois moved the ball and kept itself in the game late. Yet again, the Illinois defense was carved up by another team on the ground. Northwestern is not one of the better running teams Illinois faced this year (worst in the Big Ten before Saturday) but had its best production of the year. That has happened to Illinois too often this season. The defense was better during this game than the 63-0 thumping against Iowa, but gave up 261 rushing yards and allowed Northwestern to convert on eight of 13 third downs. Smith has his work cut out for him with improving this unit. AJ Bush’s last game as an Illini may have been his best, especially in the air. His passes were consistent and his decision-making was fairly solid, though he had a costly interception late in the game when Illinois had driven into the red zone, down only eight points. He linked up with six different receivers, most of whom should have had more catches for more yards. Bush didn’t do as much on the ground but still moved the ball himself at times. The Georgia native set the Illinois record for rushing yards by a quarterback in a single game earlier this year (187 at Nebraska) and is third all-time in the program for career rushing yards by a quarterback. He did that in nine games as an Illini quarterback.